So you have decided to buy a Katzkin upholstery kit online? 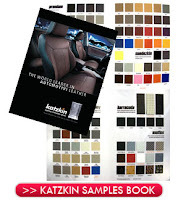 Whether you are upgrading from cloth seats to leather or replacing an old worn factory leather interior, a Katzkin replacement upholstery kit will dramatically transform your vehicle’s interior. Katzkin kits are manufactured in Montebello, California. Each kit is made to your specifications, and because they are custom ‘made-to-order’, they cannot be canceled, refused or returned . So how do you keep this a positive experience and ensure that you have ordered correctly? Rule #1 - Choose the right pattern. Understanding your vehicle’s seat specifications will make this process easier and less confusing when viewing the different pattern choices available online. Carefully look over your front and back seats. Pay attention to headrests, armrests, airbags, seating capacity, consoles, etc. Then compare your vehicle configuration to the available pattern details on the website. Familiarizing yourself with the details of your seats and the terminology will allow you to better understand the available options. But don’t worry, our Katzkin specialists at ShopSAR will email you after an order has been placed online, and before the kit is manufactured. This email will review the details of the seat specifications on your vehicle to ensure that you have ordered the correct pattern. Rule #2 - Choose the right colors. ShopSAR provides a reference chart which outlines all of the factory interior color names for most vehicles over the last 10 years and cross references the Katzkin recommended color for that interior. Don’t be fooled – different auto companies have different names for the same color, and similar names for different colors! If you are thinking about two-tone or customizing your kit with exotic materials, we recommend using the Katzkin sample book to make your final decision. With the disparity in monitor settings we know it can be tough to make an important choice like your vehicle's leather color selection by staring at a screen on your computer, smartphone or tablet. A sample swatch book is available from ShopSAR.com. The book contains all of the Katzkin materials and colors, including ‘Suedezkins’ and ‘Exotics’. Using the sample book is the most accurate way to choose your color. The best part is that the full cost, including shipping of the sample book is refunded when you purchase your kit from ShopSAR. And again, don’t worry, our Katzkin specialists at ShopSAR will email you after an order has been placed online but before your kit is manufactured. This email will review your color selections if we see that you didn’t get a sample book or if you have chosen a non-recommended color. Lastly, you don’t have to order on the computer. If for any reason you are unsure of your vehicle details or the terminology used, not comfortable with ordering online or just want to speak with someone, call us! Everyone has a cell phone and every cell phone has a camera. Take pictures of your front and back seats and email them to us. We will walk you through the process and take your order over the phone. ShopSAR values your business and wants the process of buying a Katzkin kit to be a positive and trouble free experience.